A night of inspirational Christmas worship to launch the brand new ‘while earth slept’ album: a collection of songs and thoughts from a variety of people taking us through the Christmas story in a fresh and relevant way. With music from Stewart McIlrath, Ruth Williams and the Spark worship team, a message from Rick Hill, alongside multimedia, thoughts, interviews and a few Christmas nibbles, it promises to be a heart stirring time at this special time of the year. Entry is free. CD’s being sold on the night for £10 each with all proceeds going to two charities – ‘Out of Africa Missions’ and ‘MacMillan Cancer Care’. really positive start. beautiful to see over 200 young volunteers get stuck into action in 7 areas across the town. many projects underway and lots of communities to impact in positive ways. 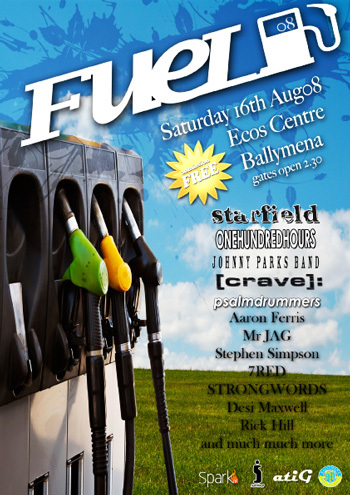 In partnership with atiG Events and Ballymena Borough Council we are excited to bring “Fuel 08” to Ballymena …a one day festival of music and activities to be held at the Ecos Centre on 16th August 2008. Fuel 08 will bring together some of the best of both international and local artists and the plan is to use it as a celebration concert for the whole community to mark the end of the week of Spark and Deepfish. The main stage artists confirmed so far include Starfield, Onehundredhours and The Johnny Parks Band. In addition to the main stage, other entertainment will include an Acoustic Cafe and a Rock Tent (providing a showcase for up and coming local bands), a photographic art exhibition, and various seminars in the Ecos Centre. Admission to the event is free. We are really excited about having the opportunity to have this type of an event in Ballymena…the potential is huge so can we encourage you all to be praying for it, asking God to use it to build His kingdom in Ballymena. Today I want to share a little from a book I read a few years ago, but this particular chapter has always stuck with me…the wonders of God’s grace just blow me away as I think about all he has given me the freedom to have and do despite what I’ve done. “A few years ago I asked some friends if they would have their two-year-old daughter, Alana, colour me a page out of her colouring book. When Alana coloured, she never worried about lines, realism or symmetry. It never occurred to her hat something could be wrong with her work. Alana coloured the page, and she brought it to me just before the Sunday morning worship service. She was very proud and excited, anxious for my response. I did respond, in the same manner i imagine most of us would respond: I lied. Of course, part of me was thinking, This is terrible. Is red the only colour you could use? How about yellow? Blue? Green? None of your strokes are even close to being within the lines. What’s the matter with you? Take this back and draw it again-only do it right this time! 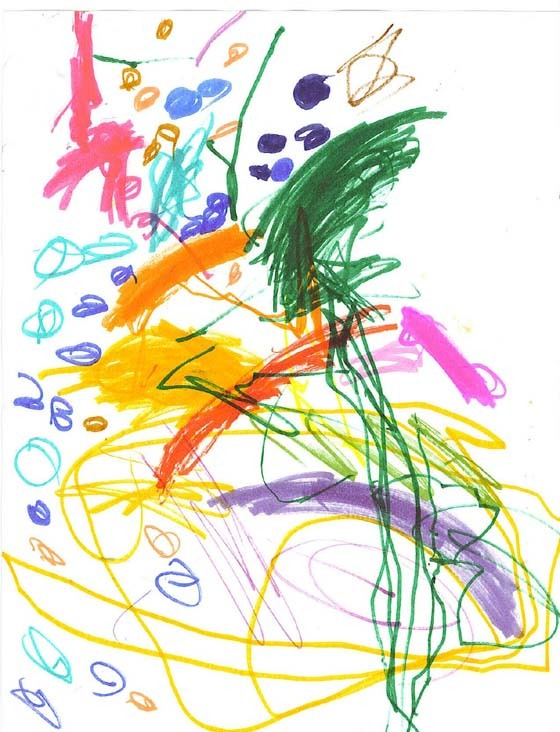 But i couldn’t criticize Alana, in part because she exhibited grace, he grace of a child who knows it’s ok to colour outside the lines. Was she naive? Sure. Most of my life I heard the message loud and clear that Christianity was all about colouring within the lines and colouring well. If I was a good Christian, if I loved Jesus and wanted to please Him, if I read my bible, prayed, and went to church, then I would get better and better at colouring. And if i lived a long and godly life, I would eventually be able to draw close to the perfect drawing. Wherever that message came from, it was a lie. I am fifty-five years old, and my colouring still looks like Alana’s. What an awesome freedom we have in Christ, free from constraints of sin thanks to his death for us. Today let’s thank God for the freedom he has given us in his son and the grace he has for us in it. As we look ahead to tomorrow-the start of Spark ’08, pray that God will show you the full freedom you have in him, that you will feel completely yourself as you serve him on the streets, free to do exactly as he has planned. Sometimes i think it’s so easy for us to slip into the mindset that God only does big things and only changes lives in miraculous ways in far flung places….places you’ve travelled to on the back of a minibus down hundreds of miles of dirt track under the blistering sun to some tribal community. That’s where God works, not sleepy little Ballymena in comfortable Northern Ireland. Yet our God is that same God, the God of the universe, beyond our earthly minded limitations…He does far more in Ballymena than we’ll ever see and has been here for centuries. So often we may as well drift through everyday life with our eyes closed and ear plugs in, we’re not really expecting anything to happen here. We focus on the obvious things of life, not really searching for God’s presence in every moment. “Twelve,” they said. “And when I fed the four thousand with seven loaves, how many large baskets of leftovers did you pick up?” “Seven,” they said. “Don’t you understand even yet?” he asked them. Let’s not be like the disciples as prepare for next week. We believe in a God who powerfully acts, everywhere on his earth. Let’s ask Him in our prayers today to show us how He is already working in peoples’ lives in our own town. Let’s not be so rooted on the physical practicalities of Spark that we can’t see the spiritual truths. Let’s be open to the ways of God, ask Him today to reveal ways that you can join Him in the work He is already doing. Watch closely for places God is, if we ask expectantly He will reveal Himself in Harryville…in Dunclug….n Fisherwick…on the Doury Road…in Ballykeel…in Ballee…in the Town centre and in Demesne. Open our eyes and ears today to see God at work, He’s already there. prayer journey #1 – what are you bringing with you? Well here we are, just under a week until Spark 08 hits the streets of Ballymena. Hundreds of God’s young people flooding the streets in service of their king, sweeping, weeding, chatting, laughing to show people Jesus. It all sounds so exciting, the potential housed in this week is phenomenal but it’s up to us, the volunteers, to be totally available and willing for God to use us and send us wherever he wishes. How are you feeling right now with God, have you talked to him today? As we enter next week it’s vital that we’ve talked to God and off loaded the burdens we’re carrying. The worries of friends, the stresses of work, our attitudes, our habits or even anxieties about our relationship with God himself. It would be foolish to try to enter an exhausting, trying race carrying extra weight. Clearly you wouldn’t do as well…so let’s take that same attitude to Spark. Today let us bring these hindrances to God, throw them off at his feet so that we can be totally focused on progressing towards our goal of serving in Spark next week. Seeing people come to know our Saviour. …it’s as simple as that, no strings or baggage attached, just us and our Father walking hand in hand as we enter the week. Today let’s seek our true freedom in God. We’re meeting from 10am to 11.30am but feel free to call by for a short while if you can’t make it for the whole thing. It would be great to have you join us! 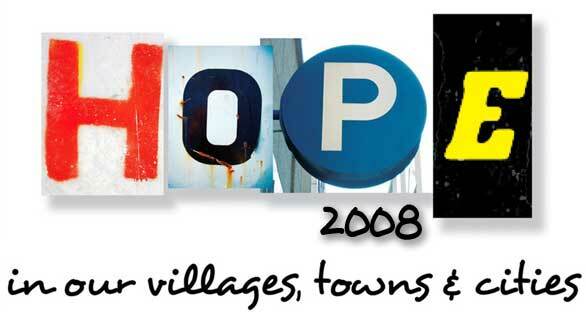 This month we are focusing on the churches in our town and reflecting on how God has blessed it through them. More so, we’re going to pray for how God is moulding and shaping our churches to share His love in today’s world. It’s so important to support and pray for our churches and their leaders so please join us for this uplifting and exciting morning!! Also, application forms are now available!! If you haven’t recieved a copy yet but are keen to get involved in Spark08, please email info@sparkballymena.com with your name and address and we will get you one asap! Hopefully you are getting as excited as we are!